Christina Mandelski loves to bring the characters in her head to life on the page. When she isn’t writing, she’s spending time with her family, volunteering, traveling or reading (preferably under an umbrella at the beach). Although she’d love to create amazing cakes like the main character in her book, THE SWEETEST THING, given past experience she’s decided to stick with eating them. Christina lives with her husband and two daughters in Houston. You can learn more about her at www.christinamandelski.com. Readergirl: How long have you known you wanted to be a writer? 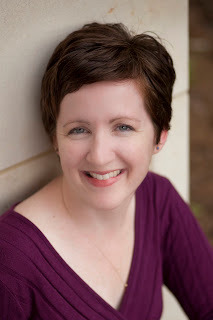 Christina: I was a voracious reader as a kid and was maybe seven or eight when I decided I would be a writer. There was something so magical about books to me – transporting me to another time, another world, placing me in someone else’s shoes. I knew without a doubt that I wanted to make that kind of magic. Readergirl: What was your submission experience in terms of number of manuscripts written and length of submission time before publication? Christina: I was very fortunate that within nine months or so of signing with my agency, Egmont USA offered to acquire the manuscript and turn it into a book. Of course, the journey prior to that was long and sometimes bumpy. I wrote three full manuscripts (and started about a gazillion others) before The Sweetest Thing. Now that my pub date is almost here, though, I know it’s true what they say – it is totally worth the ride! Readergirl: How did you celebrate receiving "the call" that your book was going to be published? Christina: This is a bizarre story, but I was waiting at home to hear and finally had to leave for a hair appointment. I held my cell phone in my lap through that entire haircut. No call came. A few hours later a voicemail appeared on my phone. It was from my agent, with the good news, left while I was at the salon. Apparently that hair salon was in the deadest of dead zones. So – long story short, I got the message a few hours late – but of course I was just as excited! Next time I expect good news, though, I’m skipping the hair appointment. 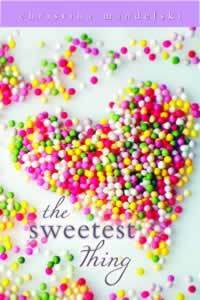 Readergirl: How did you get the idea for The Sweetest Thing? Christina: The story is about a teenage cake decorating prodigy and I love reality cooking shows. One night I was watching Ace of Cakes and I thought, “what if a teenager could make cakes like that?” And that was the initial seed that grew into The Sweetest Thing. Christina: When I was in college getting my degree in Creative Writing, I assumed I would write for adults, but when I graduated and started working at a desk job, I stopped writing altogether. When I finally got back on track, it was because of a friend who was starting up a Society of Children’s Writers and Illustrators chapter in our hometown. She’s the reason I got into children’s literature. I thought I’d start with picture books honestly because I thought it was probably easy (ha, was I wrong!) but eventually I found my voice writing young adult and middle grade novels. There’s a brevity of language and an extreme honesty in books for children. Kids don’t want flowery language and overwrought descriptions, they want the truth. I love that. Readergirl: What has been the most challenging thing about writing and publishing The Sweetest Thing? Christina: By far the most challenging thing has been learning the business of marketing a book. I am not a natural salesman by any stretch, but I’ve really coming out of my shell to promote my baby! My favorite thing to do is talking to kids about reading and writing. I try to convince them that writing is not scary, and that no matter who you are, there’s a book out there somewhere for you to love. Christina: Ack, I get all teary-eyed just thinking of it. The most rewarding thing about this experience is that I get to serve as a living example to my daughters that with a little hard work, dreams do come true. Christina: Oh yes, so many. I love Katherine Paterson. She’s an inspiring writer who gives back to other writers. Love Jane Yolen, love Richard Peck, Madeleine L’Engle, just to name a few. Readergirl: Will you be taking part in any book tours, signings, or release parties that your fans might like to know about? Christina: I’m having a book launch on May 14th at Houston’s local indie, Blue Willow Bookshop. And I’m traveling to the BEA conference in New York City in May. I’ll be tooling around town with other members of the Class of 2k11 (we have several events planned which will be posted on our website – www.classof2k11.com). I’ve never been to NYC, so I’m very excited to take my first bite out of the Big Apple! Readergirl: What will be your next project? Christina: For the last few months I’ve been working on a contemporary young adult novel with a paranormal twist. It really is best described as Cinderella meets Dr. Faustus. Angels, devils, movie stars and chicken wings – it’s been a blast! A special thank-you to Christina Mandelski for consenting, and taking time, to conduct this interview with me. I'm excited for the rest of the reading world to be able to enjoy The Sweetest Thing as much as I did!